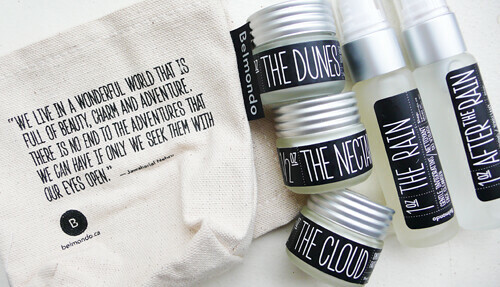 Todays GIVEAWAY is all about travel and features the wonderful organic beauty line Belmondo, which you might have seen at Anthropologie. You can win the travel kit, a $66 value and everything you need for a getaway. Daniela Belmondo created this organic (and fair trade when possible) beauty line based on the skincare properties of olive oil. The packaging is, as you can see, gorgeous (glass + aluminum), and the products feel and smell amazing - I especially love The Rain, the soap-free herbal deep cleanser, and The Dunes, a super-fluffy exfoliating and restorative scrub. This kit has everything you need for complete skincare (hand and body cream too) in one little canvas pouch. Chic. TO ENTER TO WIN THIS KIT ($66) YOU MUST COMPLETE BOTH OF THESE STEPS … PLEASE READ EVERYTHING BELOW. 2. Leave a DISQUS comment below [click through if you’re reading this in tumblr] and tell me, what’s your favorite “get away from it all” place - doesn’t have to be a vacation, it could be your shower, yoga place, whatever! Mine is a tie between Bikram and this mountain resort called Mohonk. Don’t comment in “Ask Me Anything” OR in the “FAN NOTE” area of tumblr <— guys, click through please, leave a comment on the blog not inside tumblr! Contest ends next Friday May 25, 2012 at 11.59pm Eastern. If you subscribe or follow to enter, you must be subscribed or following at the time of the drawing. Multiple comments DO NOT increase your chances of winning but love ya. Winner is drawn at random.